Drugs are not coming into the US through unwalled sections of the US southern border, say former cartel members testifying at the trial of Mexican kingpin Joaquin ‘El Chapo’ Guzman. The traffickers have said the majority of drugs come in through legal ports of entry on ships, submarines, trains, tractor-trailers and cars. Additionally, most smugglers are not undocumented immigrants but rather legal drivers allowed to enter the US. It comes as President Donald Trump has pushed for a wall or a steel barrier to be built along the southern border, insisting it will help curb the amount of drugs entering America. 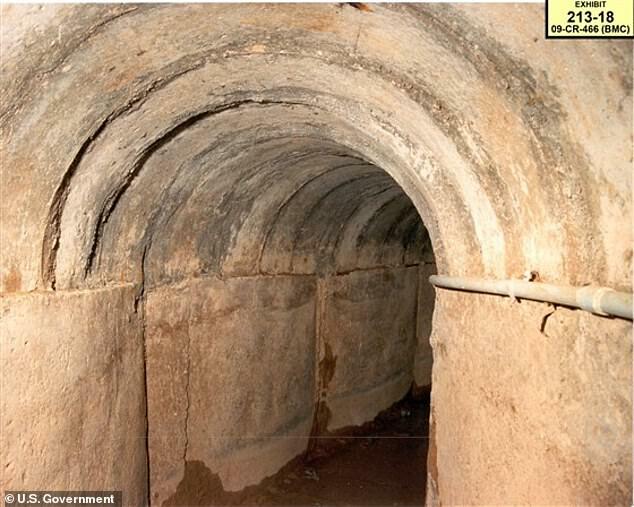 Then there’s El Chapo’s famous network of tunnels – all of which can avoid barriers put up along the wall. Jesus Zambada Garcia, a former high-ranking leader for the cartel Sinaloa, testified on behalf of the government abut the efficiency of tunnels. ‘[A tunnel] is the most secure way to cross drugs to the US – the easiest way to cross over weapons,’ Zambada Garcia said, according to CNN. When officials began cracking down on the tunnels, that’s when drug traffickers began turning their attention towards legal ports of entry. Sneaking drugs across an unsecured border would have meant being conspicuous across miles of desert, Michael Daly of the Daily Beast points out. ‘A truck at a point of entry is just one of thousands crossing there that day,’ Daly continues. The Daily Beast also notes that just 18 percent of the vehicles that arrive at check points at the southern border are searched, likely due to a shortage of custom agents. According to Zambada Garcia, tractor-trailers had ‘double bottoms’ with hidden compartments to hide drugs, reported CNN. Cocaine and heroin would also be hidden inside cans of chili or in vacuum-sealed bags covered in grease to throw off drug-sniffing dogs. However, the president is insistent that a wall at the US-Mexico will be what stops the influx of drugs from entering the country. In a tweet on Friday, he wrote: ‘…The Steel Barrier, or Wall, should have been built by previous administrations long ago. They never got it done – I will. 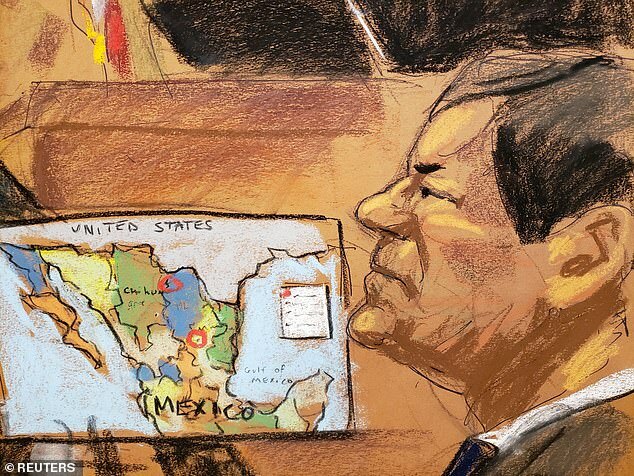 Prosecutors say El Chapo was the leader of the Sinaloa cartel, which at one stage is believed to have been responsible for more than half of drugs smuggled across the Mexico-US border. They believe he spent a quarter of a century smuggling cocaine into the US, amassing as much as $14 billion in wealth from doing so. 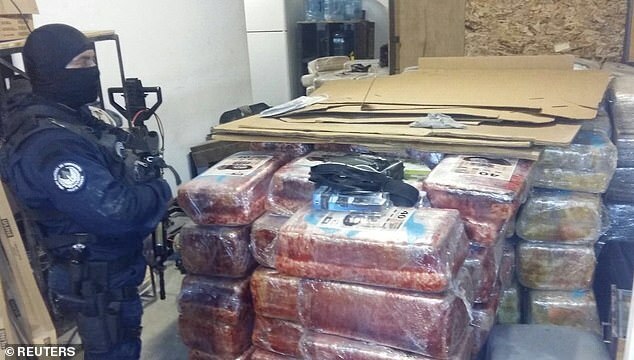 From 1989 to 2014, the Sinaloa cartel smuggled 340,892 pounds (154,626 kilograms) of cocaine into the US, as well as heroin, methamphetamine and marijuana. Assistant US Attorney Adam Fels said authorities in the US had seized enough cocaine to form 328 million separate lines of the drug – enough for every person in the US to have ‘a line’. 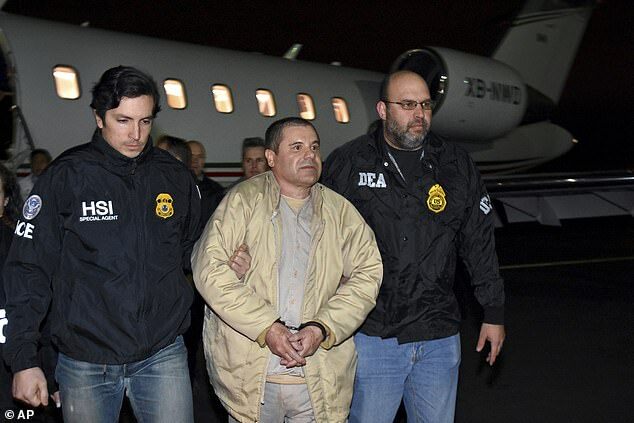 However, El Chapo’s lawyers say he’s been scapegoated in a vast conspiracy plotted by the prosecution’s cooperating witnesses – who they argue are hoping to obtain visas for their testimony – and officials at the highest levels of the Mexican government. The trial, which began in November, is expected to last up to 16 weeks.